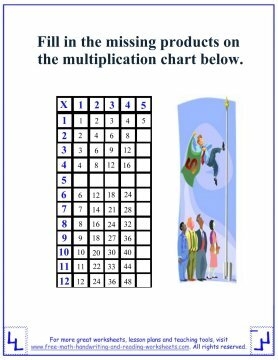 This lesson on multiplication tables will cover multiplying by fives. By now your student should be in the rhythm and know what to expect at this stage. Again - the numbers are bigger - but many of the problems in the five times tables have already been introduced in earlier lessons. Earlier lessons already covered 1x5, 2x5, 3x5, and 4x5. Now we move on and learn the products of 5, 6, 7, 8, 9, 10, 11 and 12 when multiplied by the factor of 5. 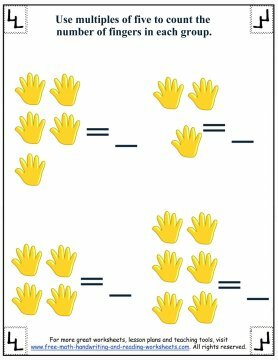 You may find it helpful to review skip counting by fives before moving on to the worksheets below. Click the worksheets to open a downloadable document in another tab. Download it then print right from your computer to start learning the fives times table. In the first paper there are four different problems. For each problem have your child count how many hands there are. Then multiply that number by 5 (five fingers on each hand). When they get the answer you can have them double check their work by counting all of the fingers in each problem. 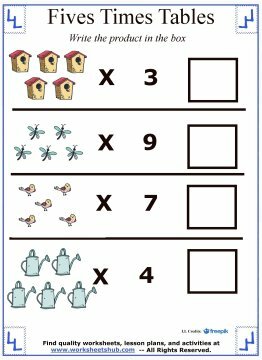 The next two worksheets are simple multiplication charts with missing numbers. Have your child or students fill in each box with the appropriate answer. The fourth paper is a maze. 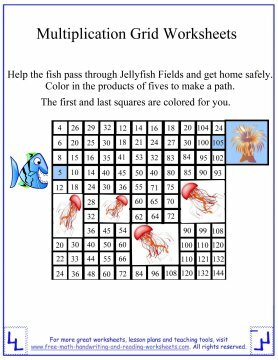 Have your child start by the fish with the number five, then color in the multiples of five to create a path to his home. 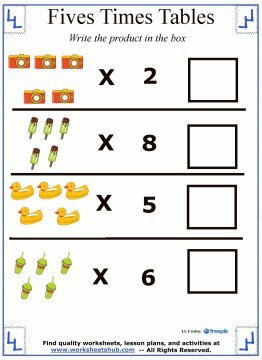 The last two activity sheets focus on the fives times table. There are four rows of items. Each item is in a group of five and needs to be multiplied by the number indicated. They're set up like basic horizontal multiplication problems (5 x 3, for example), but use objects instead of numbers. It's a simple way to add a bit of color and fun to what might ordinarily be a boring task. 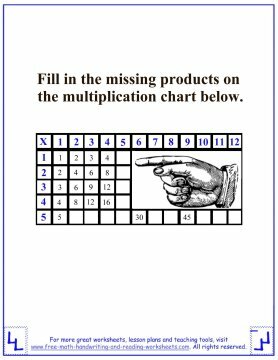 I have created a lot more multiplication lessons and activity sheets focusing on different times tables and particular factors. Be sure to check them out below.